World History I Can Statement & Log Bundle! 12 units! Improve accountability! Renaissance "I Can" Statements & Learning Goals! Log & Measure Renaissance Goals! 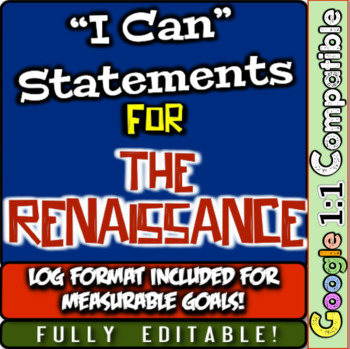 World History I Can Statement & Log Bundle! 10 units! Improve accountability! Renaissance Bundle! 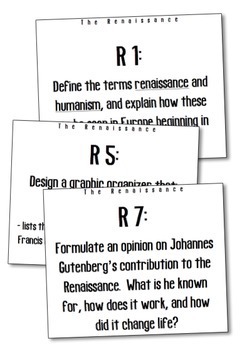 10 resources for Renaissance, Reformation, and Exploration! 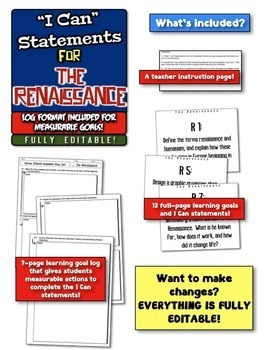 First, you receive 12 full "I Can" statements and Learning Goal posters for the Renaissance, humanism, the Medici family, Florence, differences in art (Da Vinci, Michelangelo), the Scientific Revolution (Newton, Bacon, Copernicus), Heliocentric Theory, Gutenberg and his printing press, Martin Luther, the Age of Exploration, Christopher Columbus, William Shakespeare, and more! 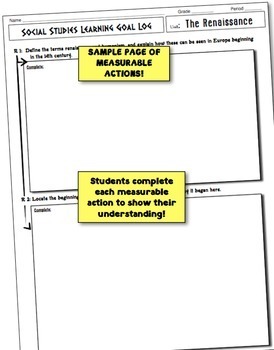 Second, the 12 statements have been arranged into a 7-page student log format where students complete measurable actions to show their understanding. For example, the first I Can statement has students, "Define the terms renaissance and humanism, and explain how these can be seen in Europe beginning in the 14th century.."
Too - everything is entirely editable!